Enrich your desserts with the finest chocolate created by the Lindt Master Chocolatiers. 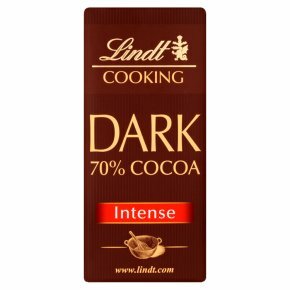 Cocoa Mass, Sugar, Fat-Reduced Cocoa, Cocoa Butter, Emulsifier (Soya Lecithin), Natural Bourbon Vanilla Beans, Cocoa Solids: 70% min. Melting Instructions: Place in a heatproof bowl over a shallow saucepan of water. Stir until melted. Ideal for smaller quantities of chocolate. Break the chocolate into pieces and place in a microwave-proof bowl. Melt the chocolate in short intervals of approximately 15-20 seconds on medium-high power and stir after every interval until the chocolate is melted. Break the chocolate into pieces and place into a heat-proof bowl, which will fit tightly into the rim of a saucepan. Bring approximately 5cm of water to a gentle simmer in the saucepan. Place the bowl with the chocolate on top of the saucepan. Frequently stir the chocolate until melted, then remove from the saucepan.